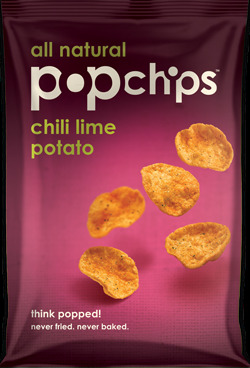 I bought Chili Lime PopChips over the weekend to go with lunch. I go for weird flavors but Matt is the one that totally dug these! I can tell when Matt really likes something when I am walking away and the convo has ended and he is still talking about them. Vegan, gluten free and 21 chips is 120 calories! Also unlike some accidentally vegan chips on the market bursting with flavor these contain no MSG if you watch out for it!